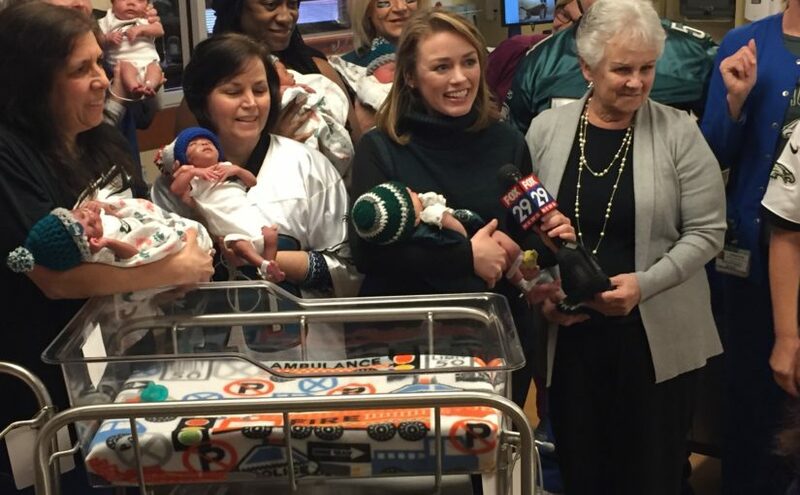 Good Day Philadelphia’s Jenny Joyce (center) reported live on the littlest Eagles fans, from Holy Redeemer Hospital’s maternity department. At right is Dotti McHale, one of two volunteer cap crocheters. Such was the media environment in our hometown of Philadelphia in the two-week runup to Super Bowl LII, featuring our underdog Birds. Trying to grab the media’s attention for anything other than Eagles-related stories was as futile as trying to dribble a football. Now – and we write this with a broad smile on our faces – all the talk has turned to The Return, and The Parade. In the City of Brotherly Love, there are no other stories of interest. 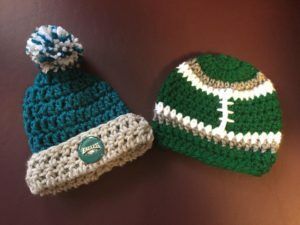 So when our client, Holy Redeemer Health System, told us soon after Philadelphia punched its ticket to the Big Game about two volunteers including a housekeeper who were furiously knitting Eagles caps for newborns in the maternity ward, we immediately launched a PR blitz. Just think of the earned media potential…a bunch of babies in the nursery sporting handmade green and gray caps. We’ve written here before about the appeal of old people, kids, and animals. The combination of wrinkled babies and underdogs in the city of Rocky was tailor made for cameras. 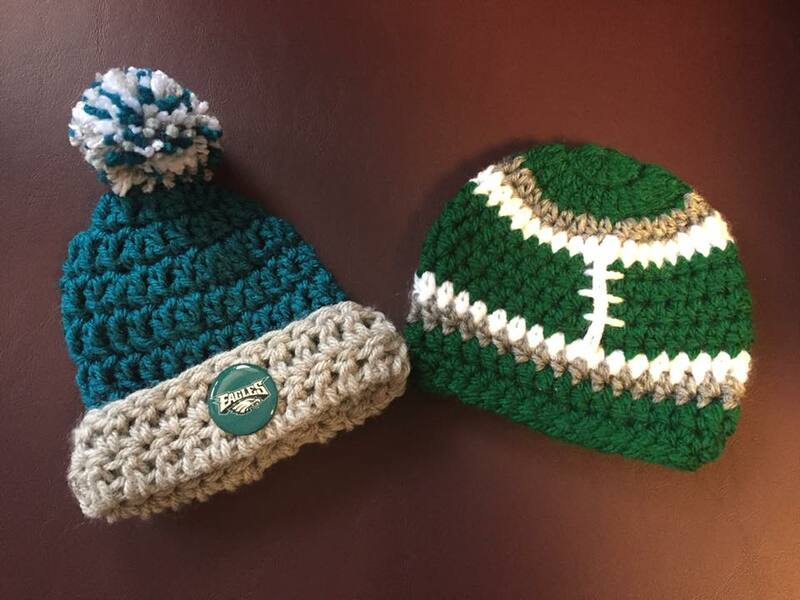 Not only that, the plan to deck out maternity staff and new parents in Eagles colors turned this into a wonderful morale boost for hospital employees, something different and a great way to let them show off their fandom while reaping attention for their compassionate work year-round. One camp in the hospital eyed Super Bowl Sunday for the rally, but we called an audible on that, knowing the media would be far too focused on day-of coverage in Minneapolis to notice our rally, not to mention the lack of afternoon news shows on the weekend. We chose the Thursday before the Super Bowl, late morning, to maximize coverage. Holy Redeemer set about lining up parents to participate, with signed release forms. SPRYTE, meanwhile, developed a media advisory, which we shotgunned to area press two days before the event. The event was dubbed the “Littlest Fans Pep Rally,” and we noted that “Eagles fans don’t come any smaller than this!” We offered interviews with new parents, maternity staff and one of the two cap makers, an 80-year-old woman whose son and daughter both work in the system. The other cap maker had a personal contact with the local Fox station, and they were immediately on board, planning a live segment for the Good Day Philadelphia program. Despite the fact the “official” rally was planned for 10:30 a.m., maternity staff scrambled to corral resources for the 9:30 segment (and the 9:15 live teaser). This also gave a wider berth to other media attending later…and a chance for the babies to rest in between. The Good Day piece came off without a hitch, and the reporter did a second stand-up for another story during the afternoon news. There were around 17 babies on hand, including a few from the Neonatal Intensive Care Unit. One turned out to be the progeny of a Patriots fan, so on-the-ball staff scrambled to craft a New England cap and onesie. “I suppose we have to love him, because he was born this way.” — Jenny Joyce, Fox Philadelphia. That poor outlier became a highly prized part of every story. And there were many. We re-set at least three more times that morning, for a daily newspaper whose coverage area accounts for a large portion of births at Holy Redeemer; for two more TV stories (one station arrived conveniently late, so nobody butted heads); and for in-house video to be shot and fed later to yet another network affiliate that couldn’t attend. Our parents, no doubt bleary-eyed and still recovering in the hours after their blessed arrivals, were great sports, happily showing up each time with their game faces on. The story aired on all four Philadelphia network affiliates between 4:30 and 6 p.m.; most included an interview with the octogenarian cap maker, and every story mentioned Holy Redeemer Hospital by name. But the images were just too cute to not “snowball” from there. Fox News national ran a story with photos online. ABC World News included video in its segment on Eagles fandom the night before the game, in the context of team loyalty being passed “from generation to generation.” CNN ran a story, which was picked up by at least one NBC affiliate in Eastern Iowa as part of their Super Bowl coverage. While the pep rally was a manufactured media event, it wouldn’t have been possible if volunteers weren’t already knitting caps. But once we knew about it, our special teams took the field, ran the playbook, and scored terrific coverage. The smiles are still plastered on our faces, and those of parents and nurses.